Did you know that an Italian doctor invented liposuction back in 1974? Four years later, the technique was used for the first time as a purely cosmetic procedure- and since then- WOW!- have things changed! By 1985, a new form of liposuction made head waves and now, over 30 years later technology has been completely transformed-again- so that fat reduction is no longer an invasive process resulting in pain, lost time and unbelievable expenses. With the brand new- and FDA-approved- procedure SculpSure, it’s easier than ever to achieve the look you want without the hassle. Dr. Geralde and his professionally trained staff are happy to be a certified provider of SculpSure in the San Antonio area. Unlike other procedures on the market similar to this, SculpSure covers more unwanted fat cells than any other process. With a completely customizable treatment plan, SculpSure is able to successfully target every area you want to remove stubborn fat cells from- in only 25-minute sessions! While the short sessions are a time saver on their own, the non-invasive process requires absolutely zero downtime, allowing patients to resume their normal, daily activities right away- no missed work, school or social events. Due to the non-invasive technology, SculpSure is simply adjusted to the treatment areas, using lasers to effectively damage the fat cells, without causing damage to the skin. Patients feel a cyclical sensation of warming and cooling temperatures throughout the treatment, neither of which result in discomfort. The entire 25-minute process is comfortable and pain-free, making this a sought-after treatment for those that fear going under the knife. While it isn’t an official purpose of SculpSure, the fat reduction in small body areas does have an added benefit- skin tightening! As your body begins to show results from the SculpSure treatment, many patients notice a tightening of the skin for a healthier, smoother look. Additionally, those that previously had slightly looser skin have reported seeing a more defined area than previously before. Finally, good things come to those that wait- but with SculpSure the wait is over before you know it. With results beginning to be seen as early as 6 weeks- and full, optimal results at 12 weeks- SculpSure patients are able to enjoy their new, slimmer looks quicker than with other procedures- and without the fear of fat cell regeneration. If you’ve been considering a treatment to help battle the bulge and finally beat those stubborn pockets of fat, contact us at Hill Country Vitality in San Antonio immediately about the amazing results of SculpSure. 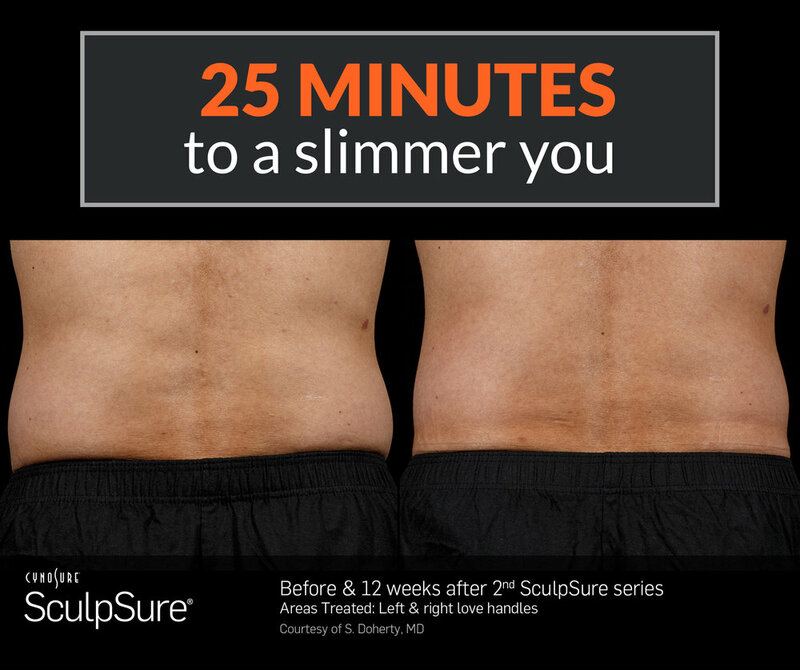 With thousands of successful treatments, SculpSure is leaving patients happier and healthier, in short, painless 25-minute sessions. Now is the time to stop worrying about the excessive cost, downtime or recovery in order to feel confident, beautiful and strong. SculpSure is FDA-approved and waiting to help you contour the body you’ve always been dreaming of.